If your idea of an engineering student is a rainbow-haired former fine arts major who traveled to Cologne, Germany for a ten-week science fellowship at the German Aerospace Center as well as a stint at Argonne National Laboratory near Chicago and, oh, yes, is a woman, then you might be familiar with Seetha Raghavan’s lab. Raghavan, an associate professor of mechanical and aerospace engineering at the University of Central Florida, is passionate about creating a world-class research environment for students – one that spans the globe, while ensuring that engineering appeals to all types of students. The rich experience also creates better rounded engineers, which gives them an edge when looking for jobs after college. “It is really important to me that students get varied experiences that will enable them to communicate globally as an engineer,” Raghavan said. That begins with attracting students who might not traditionally be exposed to engineering as a career choice and extends to leveraging high-quality research collaborations around the world. Guided by UCF’s five goals that include providing international focus to research and curricula and achieving international prominence, Raghavan’s personal story sheds light on her philosophy. As an undergraduate, she earned a bachelor’s degree in mechanical engineering from Nanyang Technological University in Singapore and then pursued a master’s degree in aeronautical engineering at ISAE SUPAERO in France. Following seven years working as a senior engineer in Singapore, she traveled again, this time to Purdue University in the U.S. for her doctoral studies. While at UCF, Raghavan initiated a collaboration with researchers from DLR or German Aerospace Center in Cologne seven years ago. This encouraged DLR researchers to travel to the U.S. to work with Raghavan and her students on joint experiments at Argonne and led to 2012 National Science Foundation funding for catalyzing new International collaborations that supported two UCF students to spend a summer at DLR’s facility in Cologne. Raghavan received further funding from the National Science Foundation, in 2015, to establish an International Research Experiences for student program that would support four students a year for three years to study with the scientists in Germany. 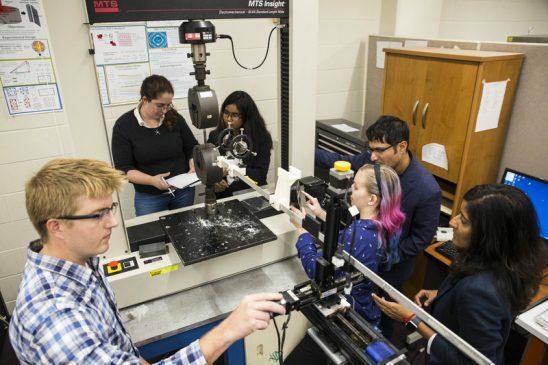 Since that time two teams of eight students have taken part in the summer experience and more UCF faculty have started to form collaborations with DLR researchers; applications just closed for the 2018 visit. The students spend the spring semester preparing their research projects and holding biweekly Skype sessions with their German mentors so they are prepared to hit the ground running once they arrive in summer. They write a blog on their experiences and organize outreach activities on international research for high-schoolers. Lin Rossmann, the former artist who originally had her heart set on being a fashion photographer, was directionless after completing her art degree until she visited NASA’s Kennedy Space Center. There, a student engineering competition inspired her to channel her love for space development into an engineering career. “It’s silly to think that engineering is not creative – engineering is all about innovation and problem solving,” she said. Rossmann returned to school for a bachelor’s degree in mechanical engineering. Her international research experience and collaboration was instrumental in her decision to continue on for her master’s degree in materials science and she has since received a NASA Florida Space Grant Consortium Masters Fellowship. She hopes to return to Germany for a year or two to focus on her research. Brooke Sarley, a senior in mechanical engineering, received a Summer Undergraduate Research Fellowship provided by the Office of Undergraduate Research to participate in experiments that were going to be conducted at the Argonne laboratory. She was so captivated by the process of creating super alloys through additive manufacturing that she applied for the international research fellowship and traveled to do research in Germany the next summer. She said her time in Germany helped her appreciate the freedom to focus exclusively on research without distraction. Being fully prepared before her fellowship helped with the intimidation factor, she said. Estefania Bohorquez, a senior in civil engineering, said she loves structural engineering and all of its applications. Her motivation for research abroad began with her interest in studying preservation of historic structures such as cathedrals and coliseums. “There is a global effort to preserve these structures and a lot of this is outside the U.S.” she said. Before her fellowship in Germany, she had experiences as varied as working for the Walt Disney co. and Siemens Power Generation researching gas turbine thermal cover typical failures. As the daughter of two engineers, she said it is probably not surprising that she entered the field but she said she was surprised to see fewer females studying engineering in the United States than in her native country, Colombia. Bohorquez has applied for a Fulbright award to return to Germany for further study next year and intends to pursue graduate school. Owen Pryor, a doctoral student who received bachelor’s degrees in political science and aerospace engineering and a master’s degree in aerospace engineering, all at UCF, specializes in combustion and how long it takes to ignite a fuel source. At DLR he had the opportunity to work with a model system that uses pure oxygen to help burn fuel that can result in fewer emissions. He said that in his years of schooling he never stopped to consider that engineering could take him around the world.